For the 84th annual awards, the one-sheet pairs the Oscar statuette with images of eight winning films from eight decades. 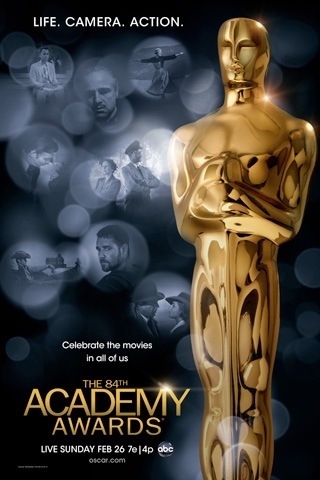 The Academy of Motion Picture Arts and Sciences released the poster for the 2012 Academy Awards on Wednesday morning. And it promises the 84th annual Oscars will celebrate — as one might expect — movies. Under the banner “Life. Camera. Action,” the poster features eight Oscar-winning films from eight decades of the show. Gone with the Wind (1939), Casablanca (1943), Giant (1956), The Sound of Music (1965), The Godfather (1972), Driving Miss Daisy (1989), Forrest Gump (1994) and Gladiator (2000) make up the films highlighted. Only one of them, however, did not win best picture. 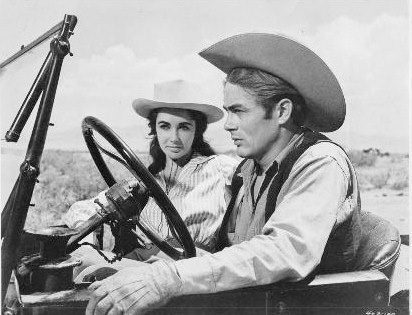 That distinction goes to Giant, which won George Stevens an Oscar for directing. The poster is available for public download on the Oscar website. The Homestretch: 10 More to Go! Currently on my DVR is the 1956 classic Giant. This is the story of a wealthy land owner and cattle rancher and his spoiled Virginian bride, and the conflicts that arise at home in Texas regarding race, class, and changing traditions (paraphrased from Yahoo! Movies). The film is as big as its title implies—and just as epic as the story and runtime is the cast. Hollywood heavyweight filmmaker George Stevens directed a monstrous cast that reads as a who’s who in classic Hollywood, including Elizabeth Taylor, Rock Hudson, James Dean, Mercedes McCambridge, and Dennis Hopper. This film sits comfortably on my 170 list and is also one of just three films to star Dean before his untimely death the previous year, in 1955. Giant earned 10 Oscar nominations and one win, for Stevens’s direction. Among the nominations were Best Picture, Best Adapted Screenplay, and honors for Hudson and McCambridge for their leading and supporting performances, respectively. Dean also received a nomination for his leading performance—his second posthumous nomination (the other being for 1955’s East of Eden, which is also on my 170 list).